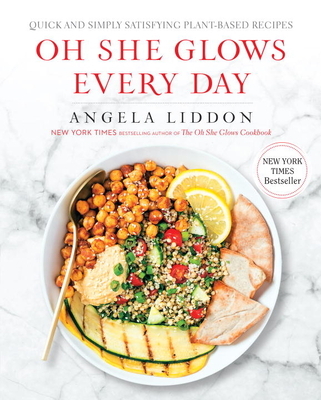 Angela Liddon is the founder, recipe developer, and writer behind OhSheGlows.com - an award-winning destination for healthy plant-based recipes, with millions of visitors each month. Her work has been featured in local and international publications such as VegNews, O, The Oprah Magazine, Fitness, The Kitchn, Self, Shape, National Post, The Guardian, Glamour, and Best Health, among others. She has also won several awards, including VegNews Best Vegan Blog for three consecutive years, Chatelaine’s Woman of the Year Hot 20 Under 30 award, and FoodBuzz’s Best Veg Blog and Best Overall Blog. Her first cookbook, The Oh She Glows Cookbook, is an international bestseller. It was selected as Indigo’s Book of the Year for 2014 and appeared on the New York Times bestseller list. Liddon and her husband, Eric, and daughter, Adriana, live in Oakville, Ontario, Canada, with their cat, Sketchie. Liddon’s blog can be found online at www.ohsheglows.com.